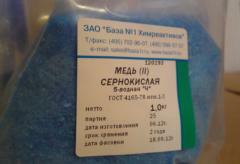 Cuprous sulfate of the 5th water blank state standard specification 4165-78. Nitric acid standard caption. Special ampoules in which are the standard titres make of glass, resistant to chemical influences, which in addition is exposed to heat treatment. The NITRIC ACID (NA) standard titres are intended for preparation of 1 liter 0,1H (normal) of solution. Iodine standard titres All ampoules intended for transportation and storage the standard titres make of material, resistant to chemical influences, - the glass having special heat treatment. The IODINE standard titres serve for preparation of 1 liter 0,1H (normal) of solution. Epsom salt. 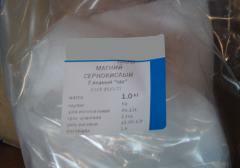 Epsom salt 7th water chemically pure GOST 4523-77. Range of application of epsom salt Epsom salt is applied as raw materials to receiving H2SO4, MgO; in production of magnesia cements; in the textile industry; filler for paper; microfertilizer. 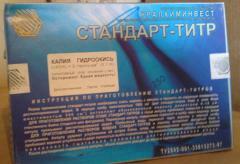 Unbelievable price on Standard titres in Sumqayit (Azerbaijan) company Fuad kimya servis, OOO. Wide choice of quality products at affordable prices.